Last month DOT announced its intent to add a protected bike lane along 19 blocks of Sixth Avenue. A coalition of advocates, business groups, community board representatives, and elected officials think the city can do better. At a press conference next to the Flatiron Building this morning, they called on DOT to redesign the entire length of Fifth Avenue and Sixth Avenue in Manhattan. In a report released today, Transportation Alternatives makes the case for protected lanes on both avenues [PDF]. Protection is needed for the large number of people who already bike on these streets, with cyclists comprising up to one in six vehicles on Fifth Avenue south of 23rd Street, according to TA. Protected bike lanes and pedestrian islands are proven to improve safety for everyone who uses the street. The share of women biking is also higher on avenues where protected lanes have been installed, TA said. “[We] have been asking for a while that the Department of Transportation make this entire area a bicycle network, so that you don’t simply have to avoid certain avenues because you’re afraid you may be hit or injured,” said Council Member Corey Johnson. TA conducted traffic counts between April and August, gathering a total of 32 hours of data. Cyclists comprise 10 percent of vehicle traffic on Fifth and Sixth. Bike-share accounts for 26 percent of that bike traffic — more during morning and evening rush hours. Counts on both avenues at 38th Street revealed that women accounted for 10 percent of cyclists. TA reports that the share of female riders is twice as high — 20 percent — on First Avenue and Ninth Avenue, which have protected bike lanes. On the other hand, White said, “I think it’s safe to say, if you could do a protected bike lane on Queens Boulevard, you could do it anywhere.” The Queens Boulevard bike lane primarily used buffer space already on the street, however, and did not require much reallocation of space from moving cars to bicycles and pedestrians. 10% of traffic on Fifth and Sixth are Bikes with 0% roadway. how many need to die or get maimed before Trottenberg steps up ? While we’re on the subject of 5th and 6th Avenues, it greatly annoys me that these avenues aren’t completely closed off to traffic around the Rockefeller Center area during the holiday season. Pedlock there is all too common. Would it really kill the city to divert motor traffic elsewhere from maybe late November until the second week of January? Probably a few other parts of the city should be closed to motor traffic also during the holidays but this area comes to mind first. Can we get wide comfortable protected lanes while we are at it? What they have suggested so far on 6th Ave are inferior to what Koch had in 1980, inferior to NACTO recommendations for high volume cycling facilities, and inferior to what other US cities are building. 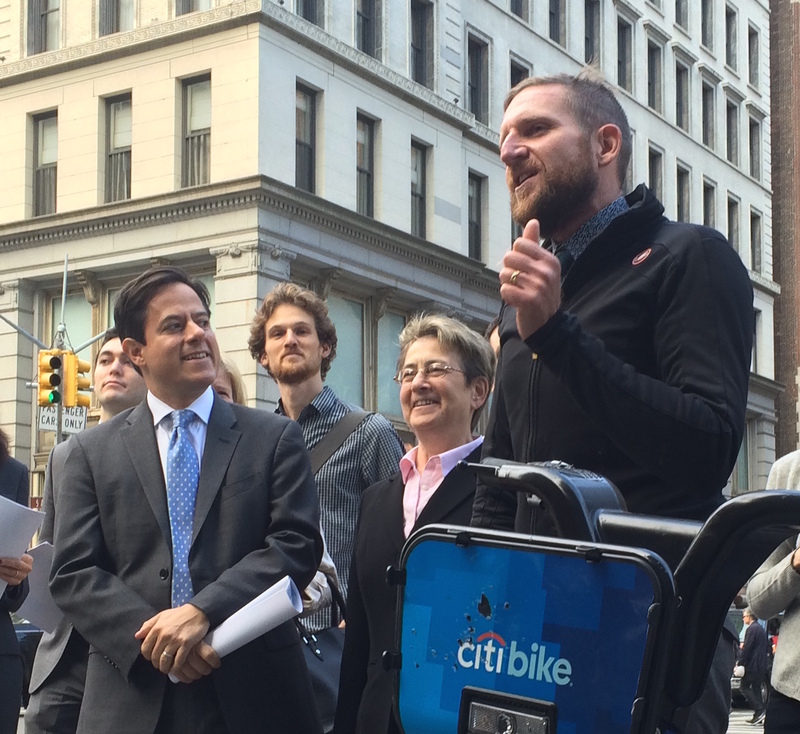 Trottenberg’s statement is the closest thing NYC has to a bike plan. To be fair, there techincal are bike lanes on parts of 5th & 6th, but they’re so full of double parked cars you can hardly count them as space devoted to bicycling. Thanks to TA for, as always, doing steady, well-crafted work. I live on 15th btw 5th and 6th. fully complete streets would be such a terrific upgrade to the neighborhood. and not only for bikes/peds: left-turn banks make a HUGE difference on 8th and 9th in terms of gridlock and stop/go traffic. the city should not forget a dedicated bus lane on 6th. How many thousands of nyc’ers use the express buses that travel up 6th? how much commuting time would we save those commuters if we gave buses a dedicated lane? The figure of 10% would be greatly increased if it included all the people who would like to take those streets but are afraid because it’s just far too dangerous. Sixth Avenue below 9th Street is a death trap. All the N/S avenues in Manhattan should have dedicated bus only lanes with camera enforcement. I’d like to see an alternative studied and presented. A “bicycle boulevard” on Park from 14th to the end at the Harlem River, with bollards every so often to turn it into a local street for motor vehicles. One of the breaks in traffic would be at Grand Central, with the Park Avenue Tunnel and Grand Central overpass turned over to bikes, and the latter also used for extra Citibike parking. The bike lanes would be in the center, and motor vehicles other than emergency vehicles with lights and sirens would be prohibited left turns. They’d have to go around the block. With a bike lane in the center taking up less room than a motor vehicle lane, even with room for bikes to pass other bikes, sidewalks could be extended. The lights would be timed for 15 to 18 mph. And there is less bus traffic on Park than on 5th and 6th, and perhaps that could be diverted — or just put the first barrier at 25th Street, where the buses turn, and given them a special left signal to cross the bike lanes. but First can we fully open up Broadway from 23rd to 60th to pedestrians ? Something to be said for it. But you always have the deliveries, taxi pickups, and emergency vehicles issues. Which is why I like the bicycle boulevard solution. Just make it like a suburban cul de sac for motor vehicles. I’m willing to wait until the plaza construction is done to pass judgment on the viability of Broadway as southbound route through midtown. But can we please just rebuild the 8th Ave bike lane as an expanded sidewalk? That lane is unusable anyhow. May as well turn it over to peds officially. There are no buses on Park north of 25th Street. They only travel from 14th to 25th on Park because Madison doesn’t start until there. now how do you manage the pearl clutchers ? There is such a substantial public health benefit from parking protected lanes on the avenues. 1st/2nd Ave are much safer to cross than say 3rd Ave. So many arteries across the city need this treatment, now. You mean the ones who live there? The taxis and limos will still be able to pick them up at the curb. The bikes will be in the center. But through motor vehicle traffic will go elsewhere. So there will be less noise, traffic and speed on their street — and more of their traffic and noise on other people’s streets. The taxi industry might claim they won’t go down Park anymore if they could only go 10 or 15 blocks in a row to try to get the pearl clutchers opposed. But perhaps then they’ll all use Uber. Please come up to a CB8 transportation one day when they are discussing anything bike related. Afterwards, I’ll buy you a pitcher of martinis – you’ll need it. I would add something else: the sidewalks NEED to be widened on Fifth and Sixth Avenues. On all the avenues in Manhattan, really. They’re bursting at the seams with pedestrians. This again demonstrates the importance of formal loading / unloading zones. Double parking needs to go away.